This dress was another gem found at Marshall's during my last shopping trip with Lani, Lissy, Jean and Bettina. Kudos to Lani for spotting it and generously handing it over to me. It was only available in a medium and even knowing major work was required, I took a chance on it anyway. The day spent on alterations was well worth the effort because I've been wearing it nonstop. I paired it with sandals to run errands and heels to dinner. Easy breezy! The fabric is on the heavy side, great for spring and fall but perhaps not ideal for summer. I also like the shoes, pretty! very nice. 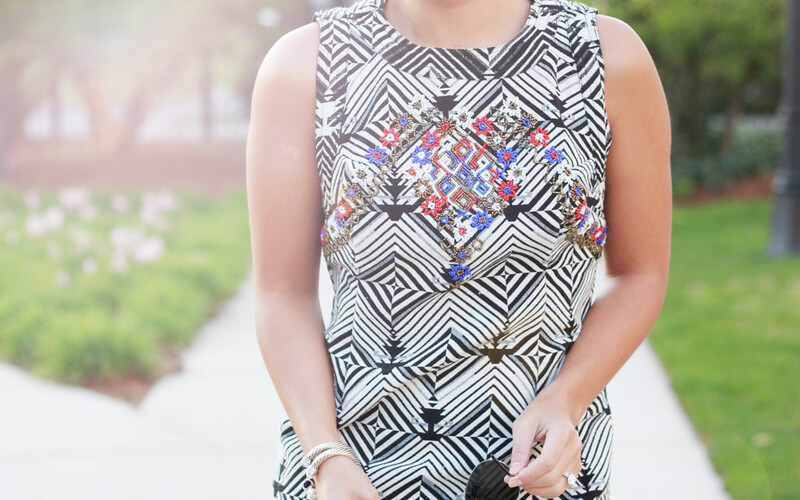 Love the print and it hugs your curves in right places. I like you have thick arms and thick legs. What do you recommend wearing to hide these flaws? Fab find indeed and Darren takes great photos (I don't know what you were talking about, he doesn't need lessons :). ahhh the alterations were definitely worth it, just gorgeous! and i love how you paired it with a cropped trench! Oh you did an amazing job altering the dress to make it fit! Love the print of the dress, too! Awesome find love Free People! I love your dress! Definitely my kind of style. What a fantastic print! It's great that you can wear it on it's own -- the print is all the accessory you need! It's not often shift dresses are super figure flattering but you did an amazing job and the print contrast is amazing! I love it. Well worth all the effort, this dress is a stunner and you look stunning in it Khatu! I am jealous it is so cute!! !